“Modularium” is the first instrument in our series. 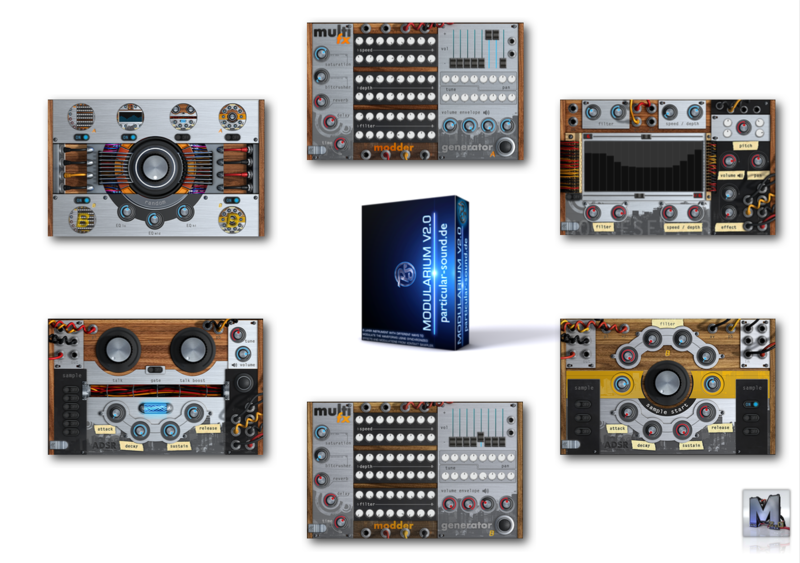 It’s a multi layer instrument containing 6 modules with different ways to shape the waveforms using synchronized effects and modulations from Kontakt sampler. You’ll get more than 150 factory presets upfront, which you can tweak, bend and explore. Now, with version 2, you’ll also get more than 50 multi patches as well. And if you like surprises, take a sound-trip and hit the reworked random button to create countless unheard sounds. The first modules in Modularium are “Generator A and B”. They are 8 layer instruments with different modulation sources to manipulate the sound. Every layer has a knob for volume, pan, modulations depth, speed and a high and low filter and ADSR (Attack, Decay, Sustain, Release) envelope. Also, you have knobs for reverb-, saturation- and delay settings in this module. The “Noicesetter” is a module which creates different types of “Noise”. Furthermore, on “Noicesetter” you have also access to the Step Sequencer, which controls the main volume output like some kind of Gater Effect. 2 Sets LFO filters to modulate the Noise section, pitch- and Pan controls round up this module. “Vocalirum” is a 6 layer Instrument with the main focus of generating vocal like sounds. You have control of the 6 layers, their sound / tonal attributes and ADSR envelope. Paddle A and B are Pad generators with several options to tweak, like e.g. Sample Start and a separate Filter-, ADSR Section.